Many web designers and developers have site templates - re-usable boilerplate code for starting new projects. With Hammer Templates, it's easy to create and re-use standard markup and libraries with every new project. 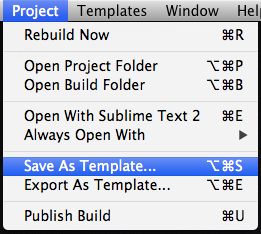 To create a Hammer Template, just choose a project, then in the Project menu, choose "Save As Template". This creates a Hammer Template, and saves it to Hammer. To see a list of your templates, just click "Manage Templates" in the Templates menu. 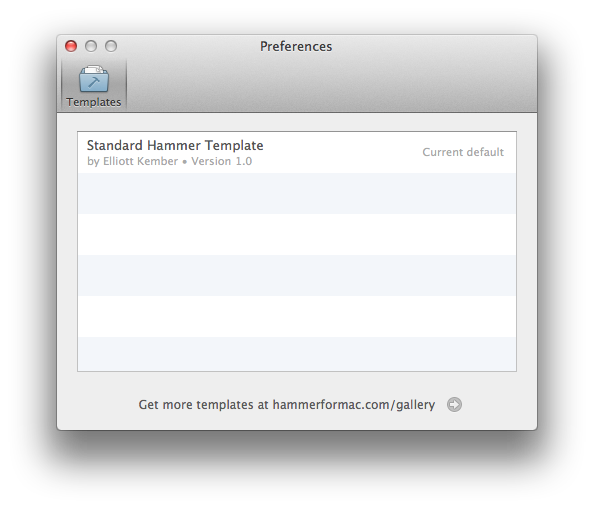 You can also export a Hammer Template. This saves the template out as a .hammer file, for easy sharing or publishing. In fact, a .hammer file is really just a .zip archive of your project with a special extension and icon. We're compiling a set of the coolest Hammer templates to feature on the Gallery page. If you have a cool template you'd love to see featured, please get in touch with us - we'd love to see what you're working on!